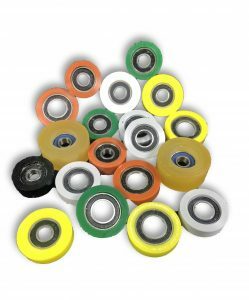 Mechanical Urethane Wheels – Abrasion Resistant! Mechanical Urethane Wheels are one of the several urethane products that find application across different sectors. They are available at Plan Tech in a variety of shapes and sizes to meet your custom specifications. To ensure that our mechanical urethane wheels are always of world-class quality, we only utilize the best manufactured raw materials produced by internationally recognized chemical producers. Having been in the business of manufacturing urethane products that offer unbeatable physical properties for over the past three decades and counting. It, therefore, doesn’t come as a surprise that our customers totally trust us to manufacture mechanical urethane wheels that provide great value for money. And the reason is that our mechanical urethane wheels offer excellent performance ability as well as long service life. The Mechanical Urethane Wheels that are cast by our technical experts at Plan Tech are capable of outstandingly resisting abrasion, wear, corrosion and chemicals. And as is the case with every other urethane product that is produced at Plan Tech, we always apply speed and consistency while producing mechanical urethane wheels which enables us to meet the qualitative and quantitative demands of our numerous and esteemed customers. Bring your ideas or sample to us today and we will wow you with our outstanding manufacturing capability. A number of industries make use of this material. Are you interested in Mechanical Urethane Wheels? Please Contact us so we can help solve your requirements and work with you on your specific application!